SALSA allows different game sounds, such as ball kicks and referee whistles, to be processed automatically by the mixing console. Fairlight is collaborating with DTS and the University of Salford, located in Manchester, UK, to develop a new approach to assist sound engineers with live sports productions. Collectively, the group said the Spatial Automated Live Sports Audio (SALSA) solution is a real-time automated mixing process that identifies the location of specific sound events from a grid of pitch microphones. The algorithm, developed by the University of Salford, identifies the type of sound event, its 3D location, and its duration, and automatically drives console fader movements to open the relevant mic(s). This real-world solution came to life when SALSA was combined with the object-based audio live production system co-developed by DTS and Fairlight. Leaving pitch microphones at a fixed level can result in off-pitch crowd noise masking on-pitch sounds in the broadcast mix. With the introduction of even more mics and immersive object-based audio, it will become even more challenging to manually create the best possible mix. SALSA helps address this problem by allowing different game sounds, such as ball kicks and referee whistles, to be processed automatically by the mixing console. SALSA can be adapted to search for different sounds, allowing the automated mixing to be applied to different sports. A new algorithm, developed by the University of Salford, identifies the type of sound event, its 3D location, and its duration, and automatically drives console fader movements to open the relevant mic(s) on cue. 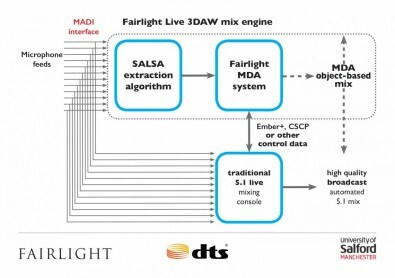 By choosing to use the open object-based audio standard MDA (ETSI 103-223: Multi-Dimensional Audio), SALSA was able to easily be integrated by Fairlight into their next-generation live production systems, supporting both conventional and object-based broadcasts. “We believe our SALSA software will bring a step-change in the quality of broadcast audio for sports and we’re excited to be working with Fairlight and DTS to showcase its capabilities in a practical work-flow,” said Dr. Rob Oldfield, Audio Research Consultant from the University of Salford. At NAB 2016, SALSA was demonstrated as part of a complete outside broadcast production workflow, from capture to reproduction. SALSA-identified objects were shown being extracted from the mix by the 3DAW system in Fairlight’s EVO.Live mixing console, and packaged into a linear MDA bitstream for contribution over SDI.